The company alternates each year between historic dolls and current dolls. This year, they introduce Samantha's best friend, Nellie. With a big blue bow in her strawberry blonde hair and a white dress with matching blue sash, she's the image of an Irish girl of 1906. Her story focuses on her promise to care for her younger sisters when her mother dies. Elizabeth Cole is a bright, quiet, unassuming 10-year-old girl growing up in Williamsburg Virginia after she and her family moved from England in 1774. Elizabeth is Felicity Merriman's best friend and they share their love or horses. Elizabeth believes that Felicity has the bravery and courage that she lacks, and thinks herself too timid. Elizabeth's older sister Annabelle often bosses her around and calls her "Bitsy", a nickname that Elizabeth hates. Elizabeth's sister and family were Loyalists, that is, they were loyal to the King of England and felt that the colonists were uncivilized and ungrateful. 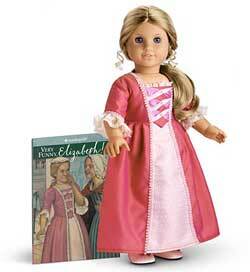 Even though Elizabeth is to be the tenth historical girl added after the collection was launched in 1986, she will really be part of Felicity's collection. 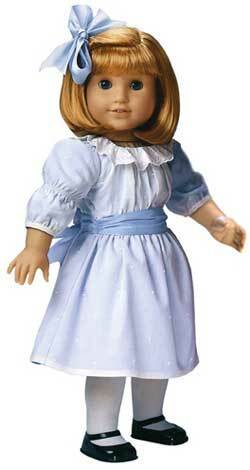 Just like Nellie, Elizabeth will likely not be a limited edition doll.